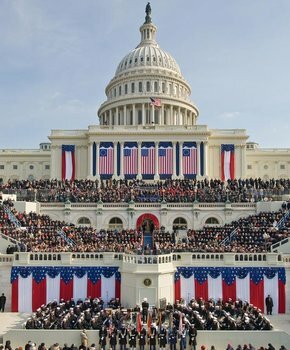 The 45TH President of the United States, Donald Trump inaugural ceremony is on-going. The vice-president, Mike Pence was introduced, followed by other VIP’s. The President elect of the United States, Trump, was then introduced while the audience cheered loudly. The Chairman, a Missouri Senator, Roy Blunt was introduced as he took the stage to give the opening remark. The opening prayer was said and the bible was read. As democratic senator, Chuck Schumer was giving his speech and said everyone should be treated equally, even if they have disability, it seems the president elect- Trump cringed. This may be because of the highly publicized comment he made about a reporter with disability, mocking the reporter and calling him a dishonest man. Senator Schumer also talked about immigrant. He finished his speech by telling the audience to stand as the Supreme court judge, Clarence Thomas, administer the oath.